Sweetfern Update: And we have a winner! The pace has really picked up at Sweetfern over the last couple weeks! Our construction manager Mike reports that they have had gorgeous fall days out there (I can just imagine!) and the house is buzzing with painters, carpenters, electricians, and tile setters. The roof is done, septic is finished, fireplace is installed, drywall is up and almost all painted, and door and window trim is in. AND .. we have exciting news! 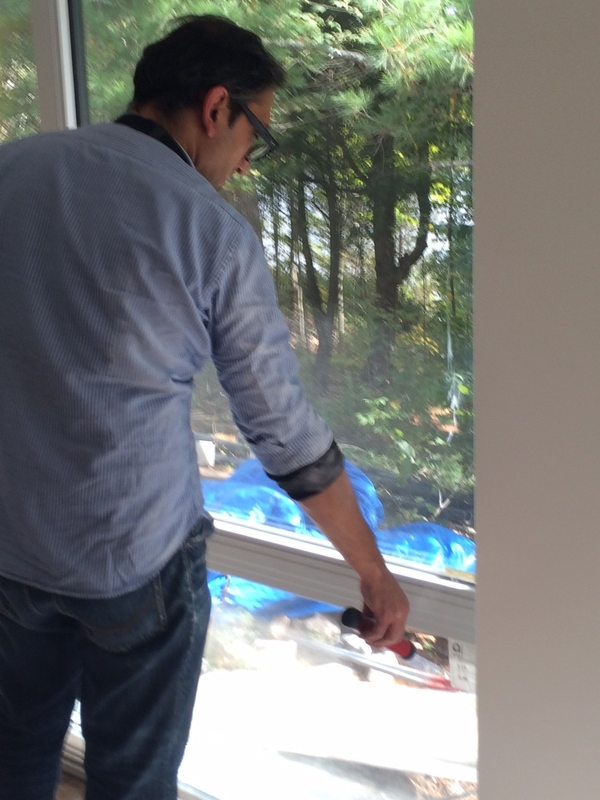 On October 3rd we had our final blower door test — actually multiple tests. If you recall from my last update, our first test result was .7 Air Changes per Hour — just above the .6 ACH requirement for passive houses. So you’d think that the score would only get better once wall insulation is in, the drywall is up and the roof is sealed. But that’s not necessarily true. First, insulating is not the same as sealing. You can add as much insulation as you want, but unless you seal the house, you’re still going to have air leaks. No matter how well you seal the roof, you still have to poke holes for vents and chimneys. And second, you’re going to be poking holes in your building envelope as you add all those things that transition between outside and inside your house — chimney pipes, HVAC system, dryer vent, electric and cable — all potential sources of leaks. So we weren’t sure what to expect for this test. Again, Shervin Akhavi of Blue Green Consulting Group came out and did his thing. 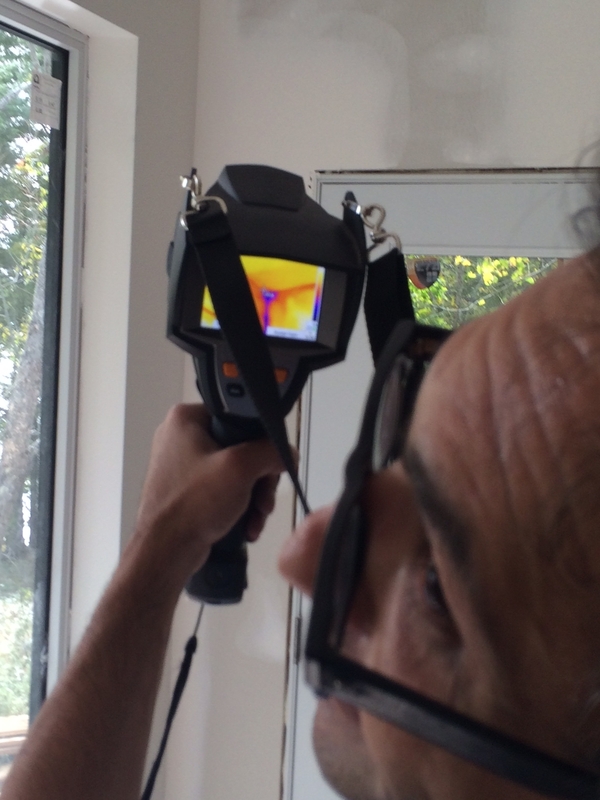 Shervin used an infrared camera to help find leaks. Corners, he explained , are always cold due to conduction. But he was looking for plumes that would indicate where convection or drafts were occurring. Using smoke, he found the seals around our windows to be airtight. This says everything about the design of our building envelope and the quality and commitment of our builders. He ran the first test and the house scored a respectable .8 ACH. Better than almost any house on the market today. But we weren’t happy with that. Shervin calculated that our leaks added up to about 20 square inches and we figured we knew right where those gaps were. With the negative pressure in the house, we could feel the wind coming through all the drain pipes. When the house is finished, these would be connected to bathtubs and water-filled toilets and would be piped to the septic system so would not be a source of air leaks. So we asked to seal the pipes and run another test and Shervin was enthusiastic. He agreed it was a fair request that would reflect the house more accurately. So we did and WHOA! This puts us in the TOP 5 houses ever tested by Blue Green Consulting and makes us the #1 tightest-sealed house designed by Solares Architecture! So on that note, here are some interior photos we took when we were out there for the blower door test. My future office — more of a space than a room — inspires me already! My office facing the opposite direction. (You see where my priorities are?) That end will be bookcase and a reading area. This will be the kitchen. The fridge will slide into that recessed space in the right corner so it doesn’t overlap the window. 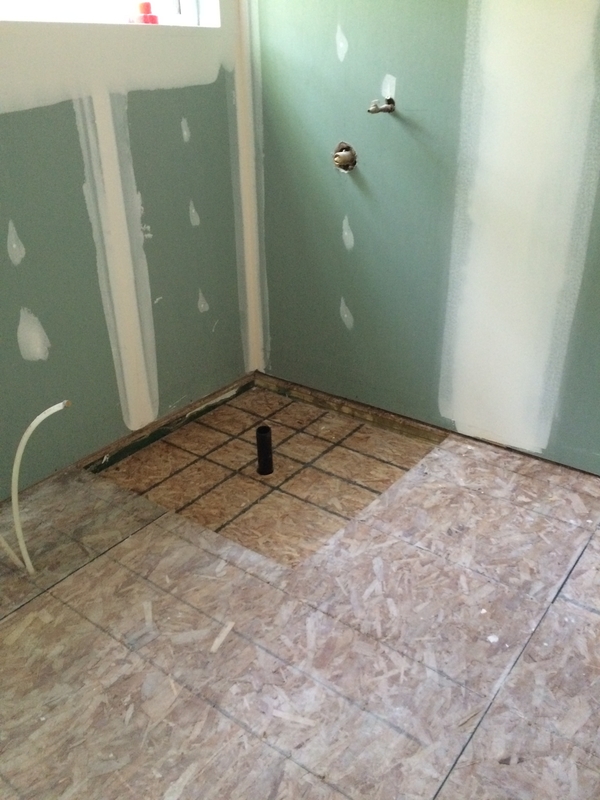 The pipe marks the island where the sink and dishwasher will go. The Fireplace wall divides my office (on the far side) from the great room. Photo is taken from the kitchen. PreviousTo My Blog Readers: Who ARE you & why are you here?